This article is 3121 days old. 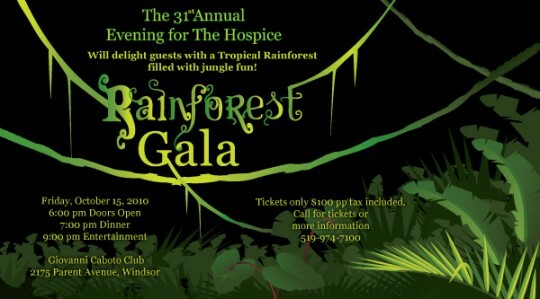 The Hospice of Windsor and Essex County invites you to come and experience their Tropical Jungle Rainforest as they mark their 31st year providing Support, Education and Empowerment to those who are affected by or are caring for a person with a life-threatening illness. The evening will be filled with visual surprises in an exotic rainforest setting that includes wild animals, tropical plants, and waterfalls. Sip tropical cocktails, enjoy a delectable dinner, take a chance at one of our draws, and help extend our future. Last year more than 1000 guests celebrated 30 years of Hospice care in our community by attending the Annual Hospice Gala. Now their focus is on preserving our legacy, and you can help. Join them on Friday, October 15, 2010 at the Giovanni Caboto Club located at 2175 Parent Avenue. Doors open at 6:00 pm, with dinner being served at 7:00 pm, followed by entertainment starting at 9:00 pm. For more information on all the great things that The Hospice does, you can visit their website.